I Love New Yoku (Bath Goods) | Dreams Inc.
Watch as the calming waves project out and transform your room into an underwater paradise. Unique pastel colored blowfish light up your bathtime. Deluxed sized rubber duckies for a fun bathtime. Swan shaped light floats gently on water and lights up your bathtime. Adorable animals taking relaxing bath to light up your bath. Pour water inside their bathtub and animal will light up. Relax and unwind with this cute rubber ducky. Water resistant and safe to use in the bathroom. Little dolphin light floats and lights up your bath. Turn out the lights and watch it glow. Gently glows to create a relaxing and enchanting atmosphere in your room or bath. Jellyfish light that fades in and out for a calming gradation effect. Water-drop shaped light glows in the colors of the rainbow. The popular Jellyfish Bath Light in special sparkly colors! Float one in your bath for an enchanting bathtime. 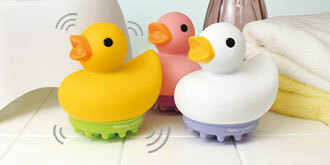 Cute little rubber ducky floats around to light up your bath or pool. Cute rubber ducky floats around to light up your bath or pool. Larger than the regular Duck Bath Light series. Submarine glows and lights up your bathrime. Available in 4 colors, including classic yellow.